The Advanced Science and Technology Institute (ASTI) of the Department of Science and Technology has announced the availability of Kalumbata Rev 4, the latest version of the Bayanihan Linux 5 (BL5) desktop operating system. 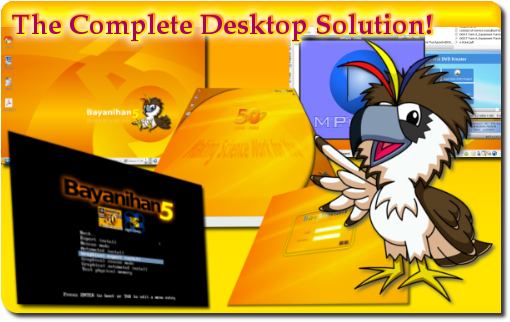 The Bayanihan Linux 5 Revision 4 is now available for download! The newest Kalumbata revision now features LibreOffice by The Document Foundation, an Open Source office productivity suite greatly derived from OpenOffice.org. However, OpenOffice.org 3.3, the latest version, is still bundled in the installer. Also packed in the new ISOs is the latest release of BL5's default web browser, Mozilla Firefox 4. Tons of security updates are also added. Bayanihan Linux 5 Rev 4 can be downloaded here for free. For more information or inquiries, email us at info@bayanihan.gov.ph.